During one of IceBridge’s online educational chats we had an interesting question from a fifth grade class in Hanover, N.H. “Are you flying near any volcanoes?” Nearby Iceland is famed for its geothermal activity, with hot springs and geysers, and volcanoes like the one that disrupted European air travel for weeks in 2010 (and caused minor concern for IceBridge mission planners at the same time) by spewing a large cloud of ash into the air. But unlike Antarctica, which has dozens of active and extinct volcanoes, Greenland is not known for having volcanic activity. Getting a handle on Greenland’s geology is hampered by the fact that the majority of the island is covered with hundreds or thousands of meters of ice. 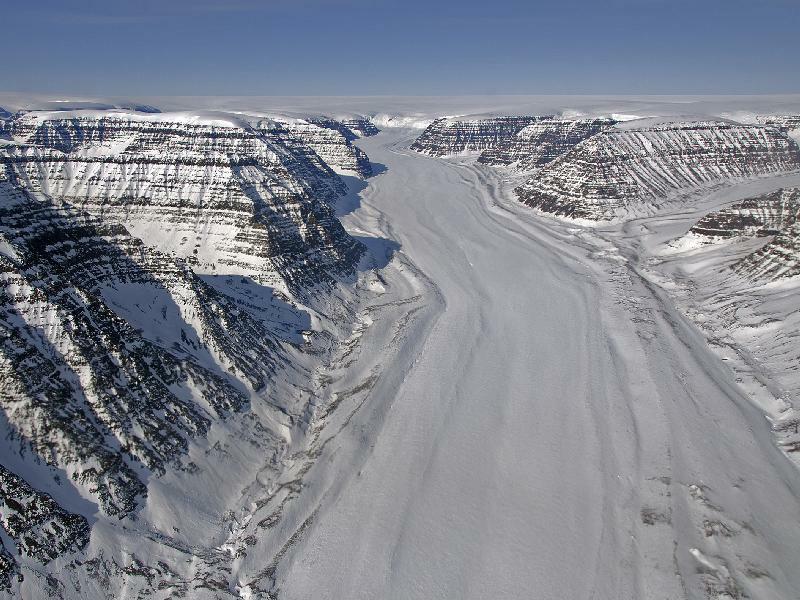 But geologists in the field who have studied the exposed rock along the coasts and on mountains above the ice found evidence of volcanoes in Greenland’s past. About half of Greenland’s exposed surface is made up of rock ranging between 1.5 billion and just over 3 billion years old, making them some of the oldest on Earth. This rock is part of a large formation that spans from Greenland, through the Canadian Shield down to the Hudson Bay. The majority of Greenland’s bedrock is thought to be made up of this ancient rock, with portions of it bent and folded by motion of Earth’s tectonic plates much like how the Appalachian Mountains in the eastern United States and the Rockies out west were formed. 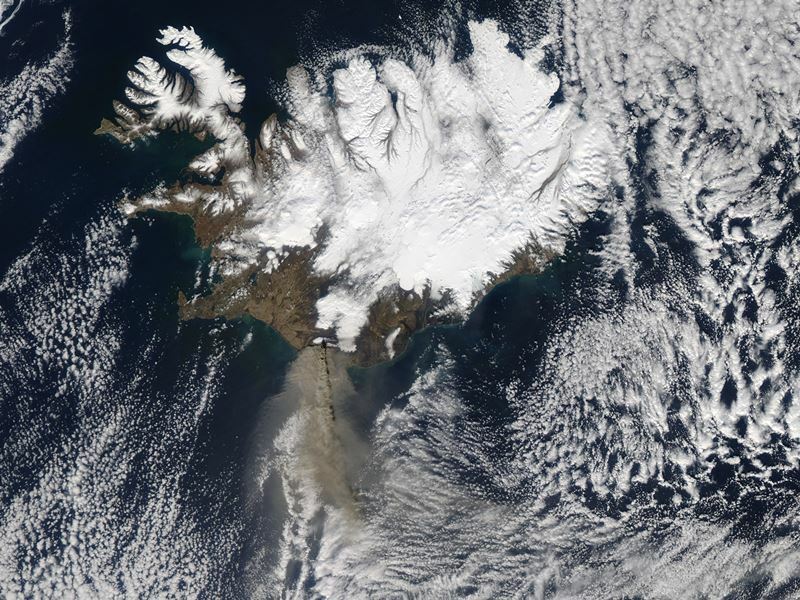 Evidence of past volcanic activity can be seen in sediments carried by Greenland’s glaciers and in one of the most visually striking geologic features in Greenland, the Geikie Peninsula on Greenland’s east coast. And it turns out that this region’s characteristic geology has something in common with present-day volcanic activity in Iceland. Both come from molten rock welling up through a ridge in the middle of the North Atlantic Ocean, a boundary where the North American and Eurasian plates are moving apart. About 60 million years ago, lava from the mid-ocean ridge flooded out over the landscape, creating a rock formation known as a flood basalt. Repeated floods of lava over the years are what give Geikie’s jagged peaks their distinctive layer cake appearance. Similar geologic structures can be seen in other parts of the world, like the Columbia River Basalt Group in the western United States. The answer for those students was no, we weren’t flying near any volcanoes. But we did get to relate our previous experience with the Iceland volcano (and learn that their teacher had a flight delayed because of the same event), and tell them about volcanoes in Greenland’s past. 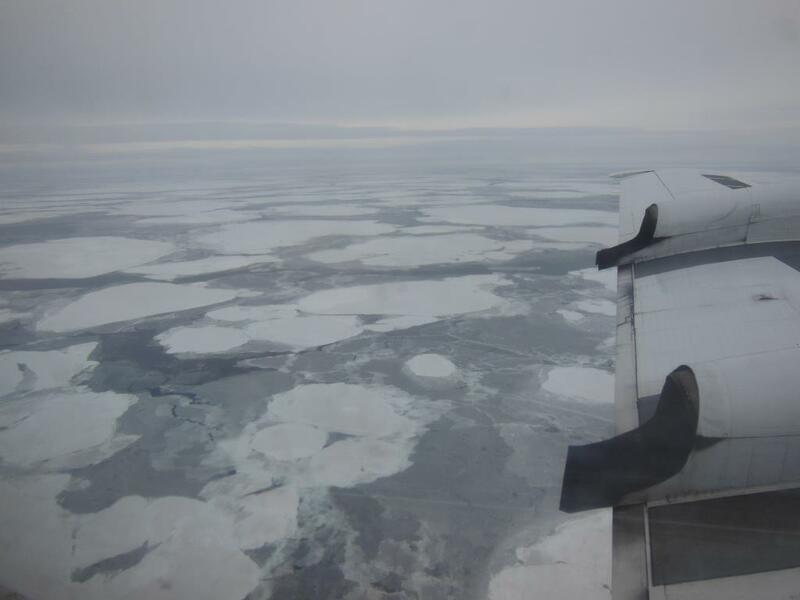 Have you ever wondered what it’s like to fly over the Arctic while doing scientific research? On April 8, you can follow NASA’s Operation IceBridge and ask questions about how polar researchers work and the science of polar ice as NASA’s P-3B airborne laboratory flies 1500 feet above Greenland’s ice sheet and glaciers. IceBridge will post live in-flight highlights on Twitter@NASA_ICE from 10 a.m. to 1 p.m. EDT on Monday, April 8 (weather delay date April 9). Follow along during the flight and hear from the scientists,engineers and guest high school science teachers on board. We’ll also be taking your questions. Just use the hashtag #askNASA. Field work in the Arctic is a unique and challenging experience. It takes an experienced and tough team to complete mission objectives from start to finish despite the biting cold, long days and noisy environment. Early morning temperatures are often in the negative single digits, and the IceBridge team powers through it preparing for flight each day. A typical day’s work can range 12 to 14 hours, a schedule that is repeated daily until the airport is closed or until the flight crew reaches a required hard down day. My project management perspective allows me to take a step back and appreciate not only the technical expertise of our instrument and flight crew teams, but the masterful choreography that unwinds each day to ensure the P-3B aircraft is prepped and ready, the instruments are powered on and in working condition, and the weather and corresponding science flight plan has been assessed and defined. Being actively involved in all phases of Operation IceBridge makes for a stronger and well-versed leader better able to assist any part of the team at any time. By doing this, I can ensure we are on track to meet our mission and science requirements, assist with troubleshooting in and out of the field, better manage project milestones, and ensure streamlined communication across all IceBridge disciplines with a common goal. But why do we do this? How do we do this? We do all of this in the name of science, collecting polar geophysical data that will help characterize the health of the Arctic and Antarctic. 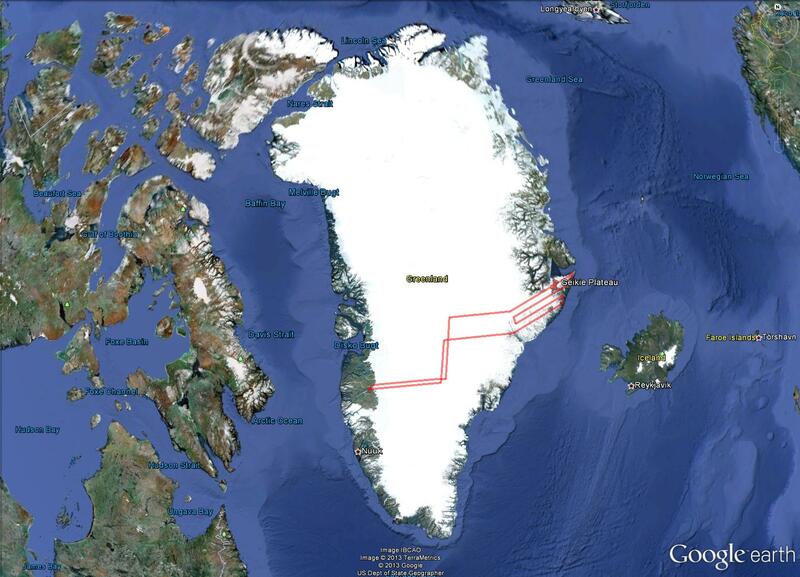 The in-field data and derived data products IceBridge produces are helping to show annual changes in the ice. These data can be entered into models that can more accurately predict what might happen in the future in terms of ice sheet, glacier, and sea ice dynamics, and ultimately sea level rise; all of which have serious consequences for climate change. But how do we reach these science goals? The steps and teamwork required are simply astounding. Each part of our team is like a puzzle piece and everyone is needed to complete the puzzle. All teams must clearly know their individual responsibilities, but also be able to work together and mesh where their job ends and another begins. The choreography starts in the beginning, or planning phase where the science team establishes targets of interest on the ice in accordance with our level 1 science requirements. Then our flight planner designs survey flights, having a unique ability to efficiently mesh the science targets with the range and flight dynamic capabilities of the P-3B aircraft. 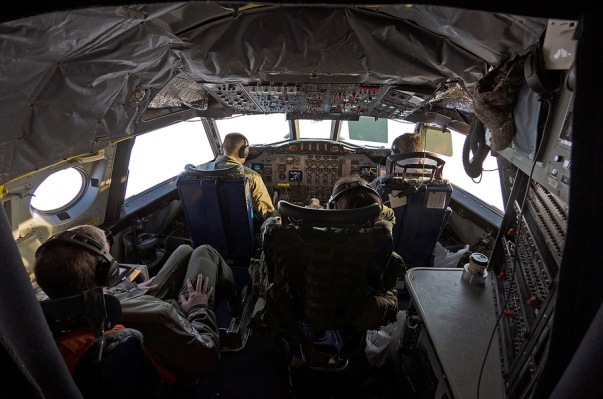 Next the aircraft office at NASA’s Wallop’s Flight Facility prepares the P-3B for deployment to some of the harshest environments on Earth and supplies the flight crew that executes the specific flight paths over our required science targets. The instrument teams provide the instrumentation—laser altimeters, radars, cameras and a gravimeter and magnetometer—and expertise in operating equipment and processing data during and after flights. Our logistics team deploys to the field ahead of time, establishing security clearances, local transportation and accommodations, and internet and airport utilities. Finally, our data center ingests and stores the data that our team collects, ensuring it’s useable and available to the wider community. Our data is not only used by polar scientists and other researchers around the world, it is also used to help satellite missions like the European Space Agency’s CryoSat-2 and NASA’s ICESat-2 calibrate and validate satellite instrumentation. Assuming a standard 8 a.m. local takeoff and eight hour mission duration, we generally have three major groups who follow different schedules pre-flight each morning. The P-3 maintenance and flight engineer crew typically starts the earliest, heading to the airport about three hours before takeoff. They prep and warm up the plane, conduct some tests and fuel it, all in preparation for the instrument team arrivals and flight operations. In parallel with aircraft prep, IceBridge’s project scientist, project manager and flight planner team head to the weather office. The team works with local meteorologists, reviewing satellite imagery and weather models to determine the optimal weather patterns that support our flight requirements—clear below 1500 feet, the altitude we typically fly—and final target selection. In the meantime, the instrument teams arrive at the aircraft to power up and check their systems prior to takeoff. By 7:30 a.m., the aircraft doors close, and we take off by 8. Our eight-hour flights range between flying high and fast, to low and slow over our targets, which include geophysical scans of ice sheets, glaciers, and sea ice. We typically land around 4 p.m., close out the plane, check data and meet at 5:30 for a science meeting. Many folks continue to work for a few hours afterward, processing data or writing mission reports. All of this is repeated daily, for up to 6 days in a row, which can be exhausting, but in the name of important scientific research, an amazing team, and majestic polar landscapes, I could not imagine anything else. 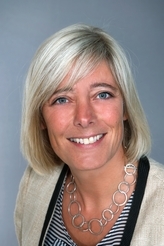 Jette Rygaard Poulsen is the science adviser for the Danish Ministry of Education, and in this role she is participating in developing new subjects for the Danish high schools. One of the latest examples is the combination of physics and geography where a special focus on the Arctic areas could be extremely relevant. Poulsen is working on how Operation IceBridge can contribute. Not only with raw data from measurements, but also with general information on the flying laboratory and the equipment usage. This insight can be coupled directly to the mathematical models the Danish students are already using during their education. 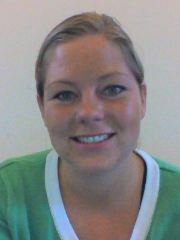 Poulsen is also the coordinator of Danish teachers participation in Operation IceBridge. Apart from her advisory work for the Ministry, Poulsen is also teaching physics and math at the general high school Hasseris Gymnasium in Aalborg, Denmark. Poulsen graduated from Copenhagen University as M.Sc in Meteorology, and has since maintained a special interest in the Arctic climate. I teach introductory science, arctic technology, geography and biology to high school students in Sisimiut, Greenland, where I moved to from Denmark in July 2012. I have a M.Sc. in biology and geography and am interested in nature and the environment, both professionally as a teacher and personally in the form of hiking, skiing, botanizing or other activities. I heard about the possibility of joining the IceBridge mission through a science newsletter for high school teachers in Greenland, and from my colleague Sine, who joined the mission in 2012. I hope that the mission will give me and future students an insight in contemporary research regarding the melting of polar ice, and a better understanding of what the research tells us, compared to what the media tells us. Following IceBridge I will develop a theme for introductory science, regarding glaciers, the research done in IceBridge, and the definition of science. The product is made available for all science teachers in Greenland in June 2013, as part of a larger web-based teaching-platform for Greenlandic high school teachers. By Mark Buesing, Libertyville High School, Libertyville, Ill. 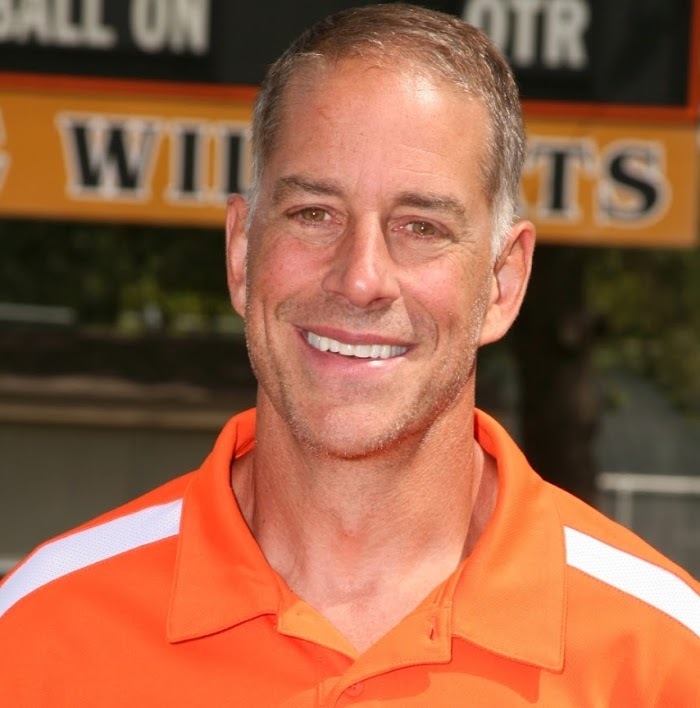 I teach physics and AP physics at Libertyville High School in Libertyville, IL – about 45 miles northwest of Chicago. My undergrad is in electrical engineering from the University of Illinois and I worked for a number of years at Hughes Aircraft in California and Motorola in Illinois. After a short stint as a professional bicycle racer, I found out I was meant to be a high school physics teacher, and earned a graduate degree in secondary education from Roosevelt University. I’ve been teaching now for almost 20 years. My route to Operation IceBridge was serendipitous. A former student of mine works for the US Antarctic Program, and while in Antarctica, she met a science teacher participating in the PolarTREC program (Teachers and Researchers Exploring and Collaborating). This student sent me an e-mail telling me about the program and encouraged me to apply. That application was selected by Operation IceBridge, which has a very active educational outreach program. My students asked me what I’ll be doing in Greenland with NASA, and I told them, “You are the next generation of scientists and engineers. Who are the next people NASA will hire to help continue all the research? … You!” So my job is to bring the science Operation IceBridge does back to my class and help motivate students to pursue careers in science and engineering. In the not-too-distant future, if the kids in my class today are working on a project like Operation IceBridge I will have done my job.